Landscape: Mid- to low-height islands, mostly forested and heavily under-brushed. 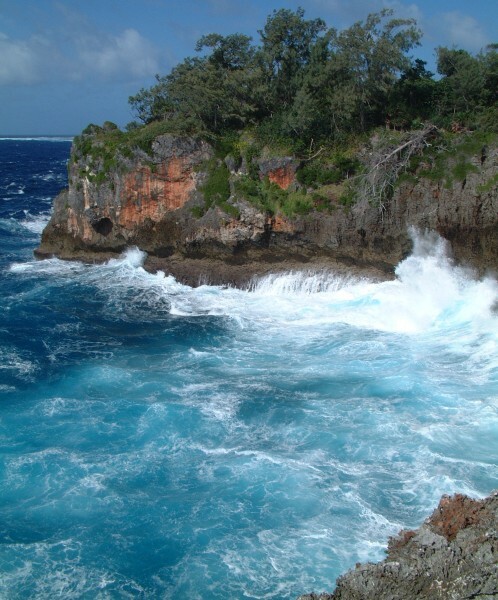 Coast is often rough limestone cliff or a narrow beach changing to rock and coral near the tide-line. Note: Cruisers who use MaxSea and are planning to cruise the Vava'u Group should check out our Passage Dangers page. On it we've included a file you can download along with instructions on how to import it into your MaxSea. The file shows the safe tracks through the Vava'u and Ha'apai Groups (as well as about 60 unmarked hazards between Tonga and Fiji). These tracks can be very useful, as the charts for Tonga are often out by as much as ¼ mile. 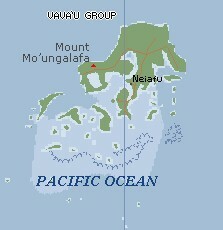 (Jon) My favorite anchorages in the Vava'u Group were Port Maurelle, Euakafa, and Kenutu. Port Maurelle (#7) is just 5 miles from Neiafu and can get crowded, but most of the non-charter boats were friends, so proximity provided good opportunities to go do fun things together, like potlucks or our dive off Ava Island. The anchorage is well protected from south, east, and north winds. There's a nice beach at the head of the bay and thick jungle all around, giving a lush, green backdrop. "Flying Foxes," the large fruit-bats of Tonga, come out in the evenings to put on a show. 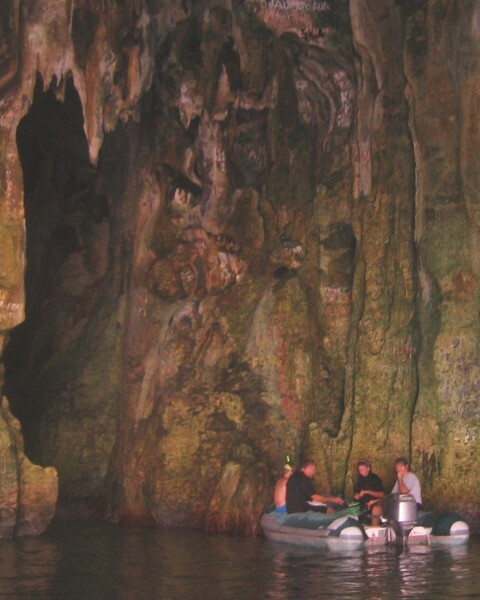 The waters are deliciously clear, with excellent snorkeling between the anchorage and the beach, as well as along the long wall just to the north. 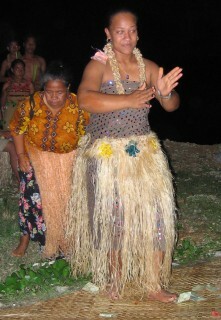 Finally, some enterprising locals give a nice "Tongan Feast" in the next bay south for only US$13/person. Euakafa (#32) is further south and more exposed from all but east to southeast winds, so it needs settled conditions. The anchoring is often difficult as the holding is bad, but there's a mooring available if you're early. Snorkeling is excellent, especially just south of the anchorage, but reefs extend all around the island and off to the west as well. Since Euakafa is in the center of the whale area, whale-song can often be be heard through the hull. There's a beautiful long beach around the north side, with an excellent trail at the easternmost end of it. The trail winds in a big loop from an old fishing/copra camp, offering nice exercise and fleeting vistas as it climbs up the hillside. On top of the hill is an ancient queen's grave, now broken open but surrounded by a large stone-work. Further along the trail ends at a point overlooking a nice cliff, offering a stunning vista to the north and east. 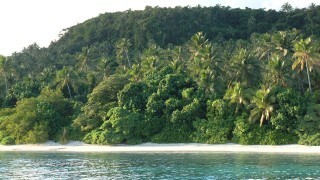 Kenutu (#30) is one of the easternmost anchorages in the Vava'u Group. It's a bit dodgy getting there, as one has to cross over or near lots of reefs, but the reefs are pretty to look at and once tucked in, the anchorage is well protected from most winds. The beach itself is OK, and at low tide you can walk to the islands both north and south. But the main attraction for me is the trail that extends from the beach to the high cliffs on east side of the island. Here, the ground is more open, allowing extensive exploring through what looks like a series of pretty campsites. The waves slam against the cliffs, spraying foam high into the air. The vista reminds me of parts of route 1 down the California coast. Magnificent! (Amanda) Outer Vava'u was very cool, and looking back on it I think I'll probably regret that we went back to Neiafu every weekend for the town-happenings. It meant that we could only spend a few days in each anchorage, and we didn't really get to that many. Port Maurelle (7) was a very familiar one, same with Nuku Island (8). But we didn't go there so often as just pass by and look at that beautiful beach and drool. It was too familiar, we wanted to go someplace new and interesting. Tapana (#11) is a small island south of an island south of Vava'u proper (very descriptive, eh?). There's a wonderful Spanish couple living there, running a paella restaurant. YUM. But also way too much food for ME to eat. The nice thing about anchoring at Tapana is that there's actually road access from there to Neiafu, so if necessary you can ask Maria to call you a taxi, and ride into town for shopping or what-have-you. The down-side of Tapana is that it's a long ways up-wind to get there. But that was easily solved once we were shown the short-cut past Mala (6), which effectively cut a 12-mile sail down to about 7. The snorkeling was nice - a friend said she saw seahorses there, but we never did - and Mom, Dad, and Chris did a dive on a bommie just south of there. Read about it on the Diving Tonga page. Blue Lagoon (#14) sounds like it should be absolutely gorgeous with crystal-clear water and white-sand beaches. WRONG! But it wasn't too bad, anyways. There's a bit of a dodgy entrance to the lagoon, past a few big bommies that come within about a foot of the surface at low tide, to a rather small anchorage. Oh, yes, and visibility in the water is maybe five feet. Okay, a bit more. But I couldn't see the bottom in 25 feet. Let's just say, not a place I'd want to arrive at or leave with bad lighting or visibility. While we were in Tonga, a boat (steel-hulled, thank goodness) actually managed to get themselves stuck up on the reef for about an hour. Luckily the tide was rising and no real damage done... except to the coral. The advantage of Blue Lagoon, though, is that it's got pretty much 360-degree protection. Okay, so a lot of that protection is just reef, which water comes over at high tide, but it's about the best you can hope for in Vava'u. We stayed there two nights, one of which we went to bed facing NE, woke up facing SW, and by lunchtime were pointing east again. It got a bit choppy at high-tide, but other than that it was fine! Mala (#6) is pretty, but not a great anchorage. The island itself is a small one a ways between two bigger ones, meaning there's quite a wind-funnel through the gap, plus a few miles of fetch upwind of that. We did go there to anchor a few times, mostly with the wind out of the NE, and actually stepped ashore a few times (ooh!) to check out (and "break" into) the abandoned resort on the island. More commonly, our appearance in the Mala vicinity was to go through the short-cut. This is a little gap in the reef between Mala and Kapa islands (you can sort of see it on the map) that is about 10' deep at high tide - we never tried it at low, seeing as there were a few little rocks in the way that we weren't sure we could avoid entirely. This pass was very handy, allowing us to head to the eastern anchorages (Tapana, Kenutu) quicker and with less upwinding. (Chris) I thought the real natural beauty of the Vava'u group was all underwater. The islands tended to be only moderately vegetated (nothing like the lush rainforests we've seen elsewhere) and somewhat lacking in interesting sights. The snorkeling and diving of Vava'u was truly wonderful, however. With that in mind, and not counting Neiafu (from where we went on many superb commercial dives) my favorite anchorages were Port Maurelle (#7), Blue Lagoon (#14), and Euakafa (#32). The dive we took off Tapana (#11) was also definitely enough to put it on the map for me, as was the La Paella restaurant. 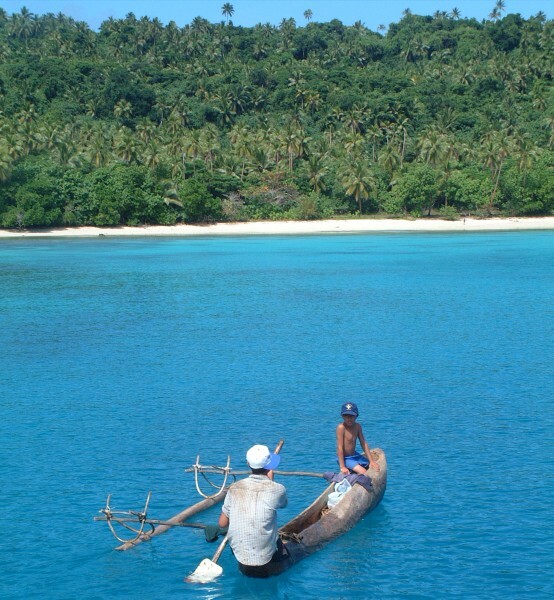 Port Maurelle, a very popular anchorage reasonably close to Neiafu, has some of the best snorkeling I've seen anywhere. To look at it from the boat, one wouldn't think so; oh, its got some bommies and a bit of reef around the edges, but the actual coral area is pretty small. However, this was not a problem; each bommie teemed with life, to the point that I sometimes spent upwards of a half hour on a single one, taking pictures whenever the chance arose. There were fewer fish over the sand between the corals, but more exotics; I saw sea snakes, lionfish, and some fairly amazing sea cucumbers. Port Maurelle (#7) was also the area from which we went to a fine Tongan feast, involving such traditional dishes as baked papaya in coconut, raw fish in coconut milk and vegetables (very similar to poisson cru in French Polynesia) and a pig baked in an 'umu, (outdoor oven pit). Blue Lagoon (#14) did not display the diving I was hoping for, but the snorkeling was beyond excellent. I only went on one real snorkeling trip there, but I think it was worth the whole sail out and back again to take that trip. Gloriously bright, shallow fingers of reef were so teeming with fish it was sometimes difficult to keep track of the one I wanted to photograph. WOW, there was so much to see! Tapana's main attraction for me was the dive we took, if not actually there, then within dinghy distance of the anchorage. However, I also greatly enjoyed two other tings in the area: a Tongan feast (our first, actually, on the night of my parent's anniversary) on the beach of southern Pangaimotu (Tapana is an island just off of Pangaimotu, an island south of the main Vava'u island) and a delicious dinner at the Spanish (as in Spain, not South or Central America) restaurant La Paella ('LA pa-EH-ya', I think, referring to a traditional Spanish dish). (Sue) Our first introduction to the anchorage at Tapana (#11) was not by boat, but by taxi -- for our 25th wedding anniversary dinner. We had a feast of pork, fish in coconut milk, vegetables, and corned beef(!) served on coconut husks. 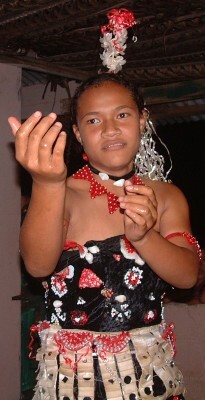 The Tongans put on a dance and we learned that in Tonga it is not the lithe young women who dance like in French Polynesia -- but the older hefty women, and the children! We also had a feast while anchored at Pt. Maurelle (Barnacle Beach feast) and saw more dancing. During our four and a half months of wandering the outer islands of Vava'u we saw the water change from cool and murky to warmer and brilliantly clear. White sand beaches are rare, although there was a lovely beach on Euakafa (especially at low tide), a small one at Port Maurelle, and a tidal beach at Kenutu, on the eastern reef. The most dramatic scenery was on the eastern cliffs of Kenuta looking out over the winter breakers, and watching them crash against the walls and spray up through the blow-holes. I added many shells to my collection from the beaches and tidal areas at Tapana, Port Maurelle, and Anchorage #16 (Coral Gardens). We heard the snorkeling on the western side of the Coral Gardens is fabulous (hence the name) but the wind and seas never cooperated to allow us to breach the wall of rollers coming in over the reef.